The February 2015 issue of Sports Car Market has a three page discussion on the 1974-76 Carrera 2.7 MFI, or "Euro Carrera", written by Prescott Kelly. 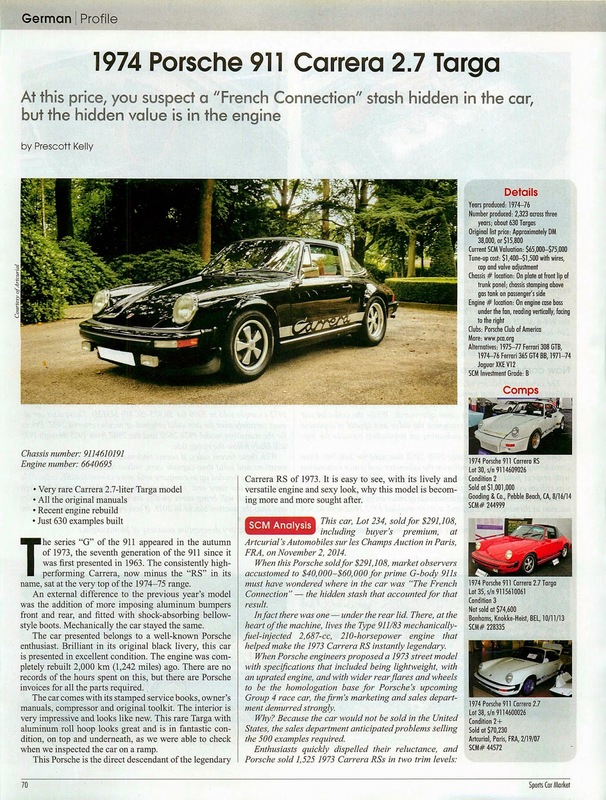 The article highlights the recent Artcurial sale of 1974 Carrera 2.7 Targa #911 461 0191, followed by a two pages that include a comparison to the 1973 Carrera 2.7 RS, an analysis of the market, and some other commentary. "If the 1974 RS 3.0 was the spiritual successor to the 1973 RS Lightweight, then [the Carrera 2.7 MFI] was the spiritual successor to the RS Touring." While the production counts were slightly off, with 46 more than actual produced units cited, it is great to see significant attention given to these rare models. "As the prices of 1973 RS cars power upward, those of Euro Carreras will most certainly follow." Unfortunately, the article doesn't mention the fast growing demand, and associated huge price hikes, of other desirable impact bumper 911s, particularly the 3.0-liter 930, 3.3-liter 930, M491 and G50 equipped Carreras, etc. Prescott Kelly finished the article by stating "A nicely original coupe with just 11,000 km (6,835 miles) and all-original paint sold a few months ago for $325,000. That looks like a smart buy now. We think the market is correct. Euro Carreras are worth the money."